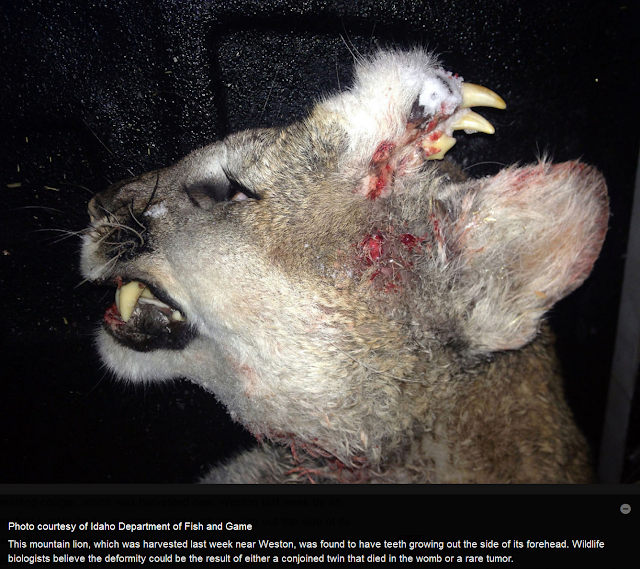 What makes this picture of this Idaho Mountain Lion so disgusting is the expected pain and suffering this animal went through before it was "harvested". I suspect this damaged animal had problems in living and getting enough food and was probably prowling around habitated areas. And even more disgusting? This article was found on the same page as people in Idaho promoting radiation research at Idaho National Lab a 1995 agreement was reached to stop adding radiation to the INL to mitigate contamination of the water aquifer directly below. And this quote from a promoter of "vital spent fuel research". 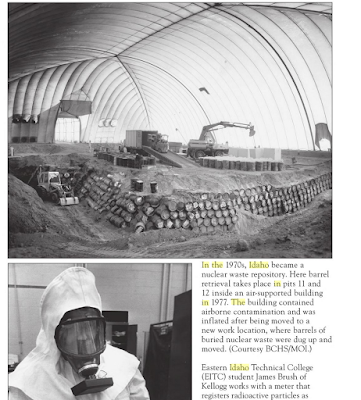 Spent nuclear fuel is the most dirty, most dangerous byproduct of the nuclear energy process. They want more of it. Damn the lions, we need jobs! 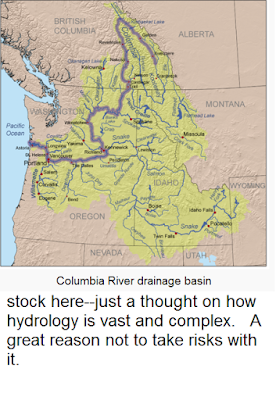 Idaho, was, and is a nuclear waste depository, or more accurately a dump. They just bury thousands and thousands of intensely radioactive barrels. ● On Dec. 30, 2015, the mountain lion was observed attacking a dog on a landowner’s property in the rural Weston area. Within three hours of the attack, the hunter began tracking the mountain lion with the use of hounds and harvested the cat legally that same day. The dog involved in the attack survived. It is also possible that deformity was a teratoma tumor. These kinds of tumors are composed of tissue from which teeth, hair, and even fingers and toes can develop. They are rare in humans and animals. Biologists from the southeast region of Idaho Fish and Game have never seen anything like this particular deformity before. 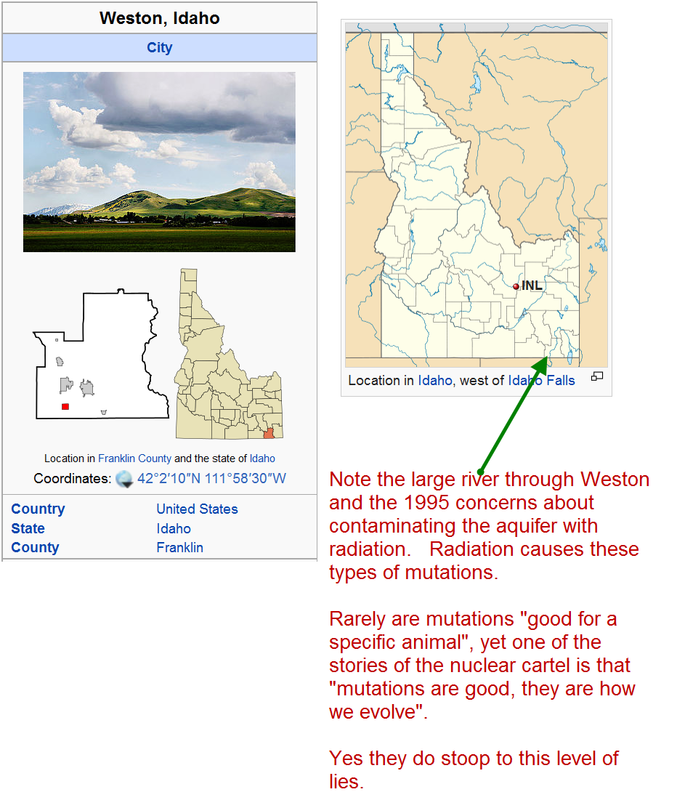 Anyone consider that is it a mutation caused by Idaho National Lab KNOWN radiation and heavy metal leakage, with a topping of Fukushima Spewage to boot? It is extremely unlikely to be a teratoma tumor, those dont Usually turn into real and multiple body parts, as opposed to normally they are just weird looking tumors. 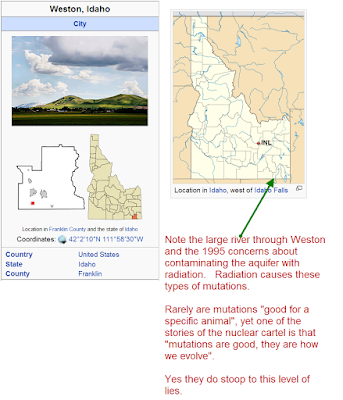 The radiation mutation is much more likely. This cat could have easily traveled from Idaho National Lab to where he was shot, they are both in the lower east side of Idaho. And that area of the country was also PELTED with Fukushima radiation, as a catalyst. I tried to drop a comment at this article, and it went into moderation. Lets see what happens, if they censor it. INL brings a lot of high paying jobs to the state of Idaho. But this article does state for sure that the cat was not a fake and was examined by a Government specialist. Biological effects differ by type of radiation. A Mutagen is an agent of substance that can bring about a permanent alteration to the physical composition of a DNA gene such that the genetic message is changed. Once the gene has been damaged or changed the mRNA transcribed from that gene will now carry an altered message. Spontaneous mutations occur without exposure to any obvious mutagenic agent. Sometimes DNA nucleotides shift without warning to a different chemical form (know as an isomer) which in turn will form a different series of hydrogen bonds with it's partner. This leads to mistakes at the time of DNA replication. Radiation High energy radiation from a radioactive material or from X-rays is absorbed by the atoms in water molecules surrounding the DNA. This energy is transferred to the electrons which then fly away from the atom. Left behind is a free radical, which is a highly dangerous and highly reactive molecule that attacks the DNA molecule and alters it in many ways. Radiation can also cause double strand breaks in the DNA molecule, which the cell's repair mechanisms cannot put right.